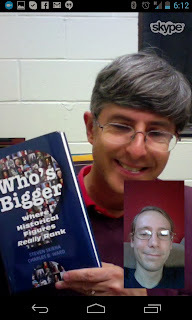 Who's Bigger: First Printing Has Arrived! The book looks good: better than we do in the picture above. It will presumably take a few more weeks until copies materialize in book stores and online: but you can order now and beat the rush. One other note. My first author interview has appeared in Critical Margins, so check it out. The interviewer did a good job, but seemed to want to argue with us about the rankings of various historical figures. Argue with our algorithms, not us. None of these rankings reflect our personal judgements, although generally we tend to agree with most of them. In particular, in almost all the cases she questioned in the interview we feel quite good about where they were placed. The Biggest Man in Azerbaijan?